When the earthquake hit on 28th September in Central Sulawesi, it triggered a destructive tsunami. Milen, a thirteen year girl was on the back of her mother’s motorbike terrified as the tsunami chased them. They luckily escaped the waves and reached a safe height of a nearby mountain, sadly only for Milen to crash from the motorbike. Milen badly injured her right knee. The family found refuge at an Internally Displaced Persons (IDP) Camp Loli Tasiburi, high in the mountains. 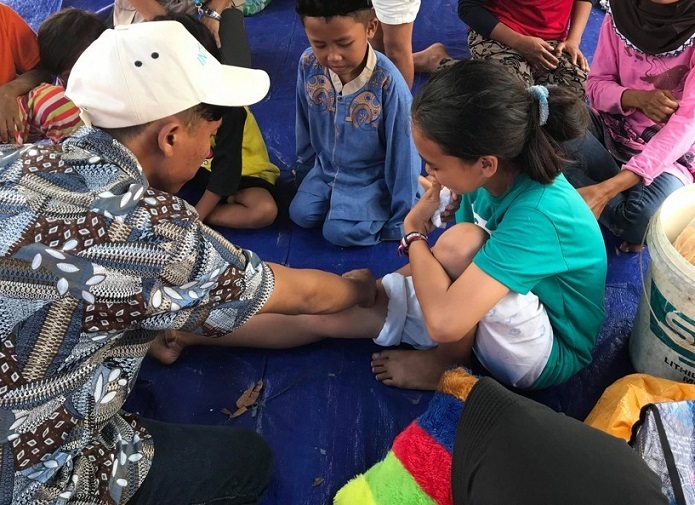 Too fearful and traumatized to leave the safety of the mountain for medical assistance, the family stayed under the shelter of a tarpaulin at the camp, for 14 days and Milen was in immense pain. Fortunately, IBU Foundation and their partner Intersos, in joint mission arrived on the 12th October to assess the IDP Camp. The medical team immediately evaluated Milen’s injured knee and found it was badly inflamed, infected and covered with flies. With Milen and her mother’s consent the team assisted in medical evacuation to the nearest hospital, where Milen was treated by local medics and later in the day returned to the IDP camp having been provided with all necessary treatment. So proud of Ibu Team! Doa Milen dan Keluarga.